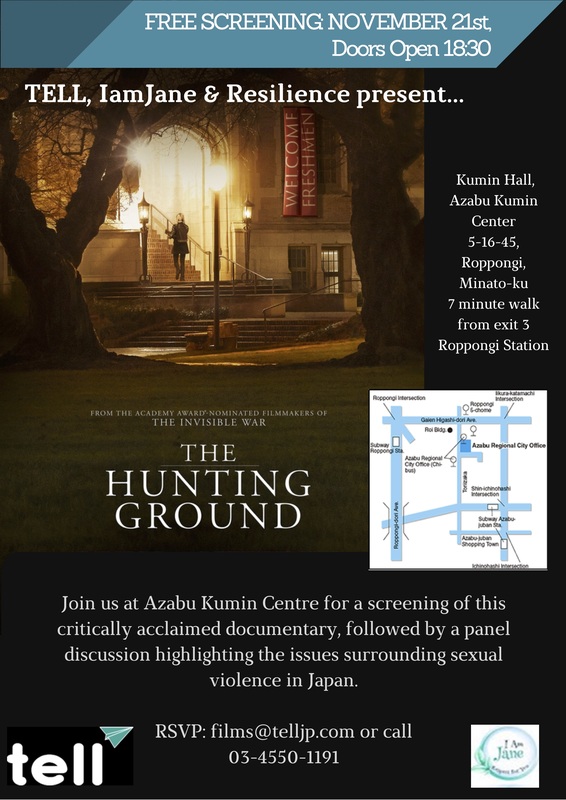 TELL and IamJane are partnering together to host a free screening of the critically acclaimed documentary The Hunting Ground. This powerful film documents the personal stories of students, who have been sexually assaulted on American university campuses, and follows survivors who attempt to pursue both their education and justice in face of institutional failures to respond effectively and appropriately to their reports. The documentary captures the confronting reality of sexual assault, and raises important issues around the impact of violence on survivors. Its stark message should leave no doubt that we must work together to eliminate the shocking record of sexual violence around the world. This award winning film has been instrumental is raising awareness of consent, the process of reporting crime and also the laws surrounding sexual assault on campus. Join us on November 21st at the Azabu Kumin Center for this special screening followed by a panel discussion highlighting the issues in Japan from a wide range of perspectives including legal issues, reporting, accessing services, and supports for foreigners in Japan. Attendance is free: There is no cost to attend but please register seating limited to 200.